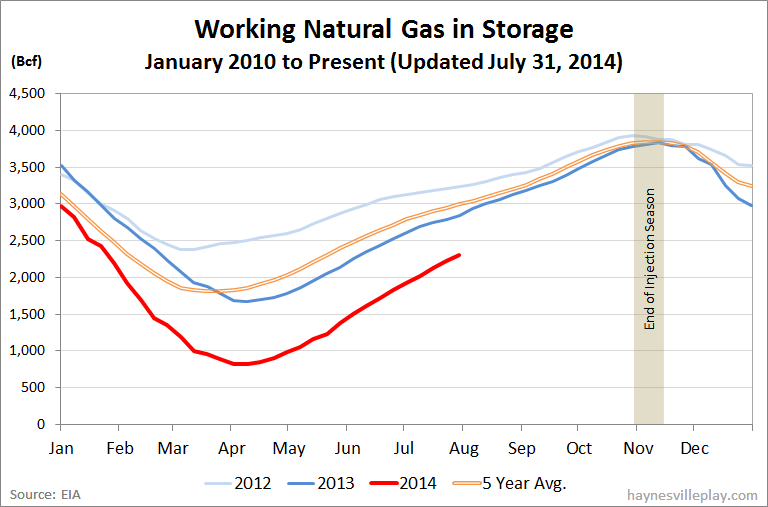 The EIA reported this morning that working gas in storage was up 88 Bcf to 2.307 Tcf. The weekly injection was 54% higher than last year (+57 Bcf) and 91% greater than the five year average (+46 Bcf). The current storage level is now 18.7% below last year (2.837 Tcf, a difference of 530 Bcf) and 21.7% below the five year average (2.948 Tcf, a difference of 641 Bcf). 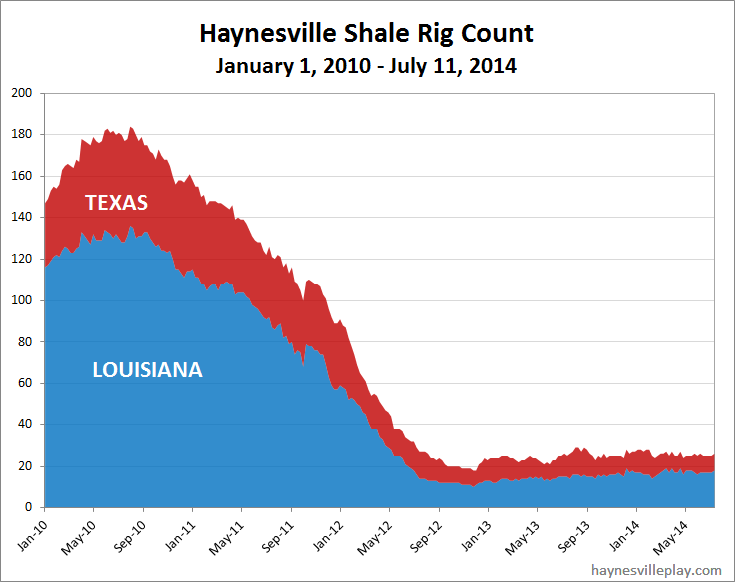 The Haynesville Shale rig count was down one last week to 25. Louisiana was down one (Chesapeake and EXCO up one each, Petrohawk down one) to 17 and Texas was unchanged at eight. 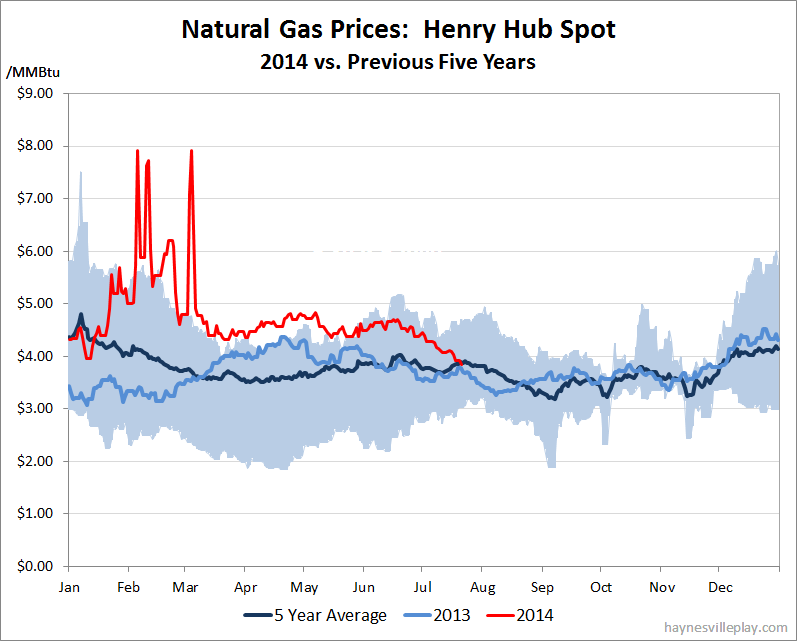 The Henry Hub spot price of natural gas dropped below the five year average this week for the first time since mid-January, hitting $3.84/MMcf yesterday. Late summer typically sees gas prices drop, but the continued high injections into storage has probably accelerated this recent swoon. Storage injections have stayed in the +100 Bcf/week range for several months, but the current level still lags the five year average by 727 Bcf. While there is little chance that the current level will catch up to the average level before the end of the injection season in November, a warm winter will wipe out the deficit in short order and gas prices will be locked back in the 3's for a good long time. 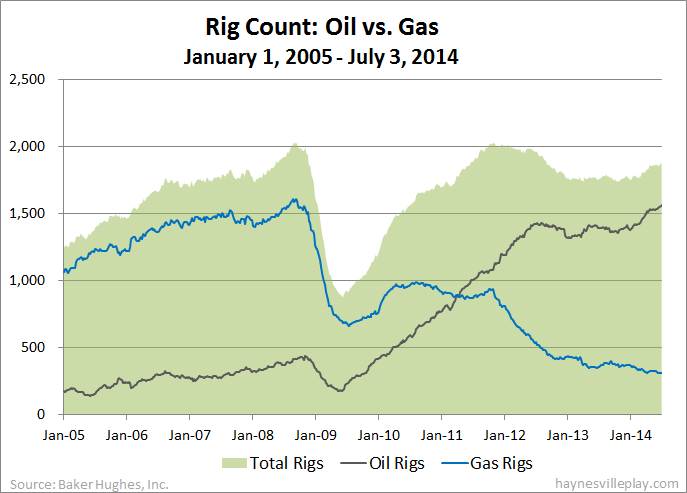 The Baker Hughes U.S. rig count was down four this week to 1,871. Oil rigs were down nine to 1,554, gas rigs were up four to 315 and miscellaneous rigs were up one to two. By type, horizontal rigs were up 12 to 1,288, vertical rigs were down 11 to 366 and directional rigs were down five to 217. Among gas rigs, horizontal rigs were unchanged at 230, directional rigs were unchanged at 64 and vertical rigs were up four to 21. Another week, another big storage increase. 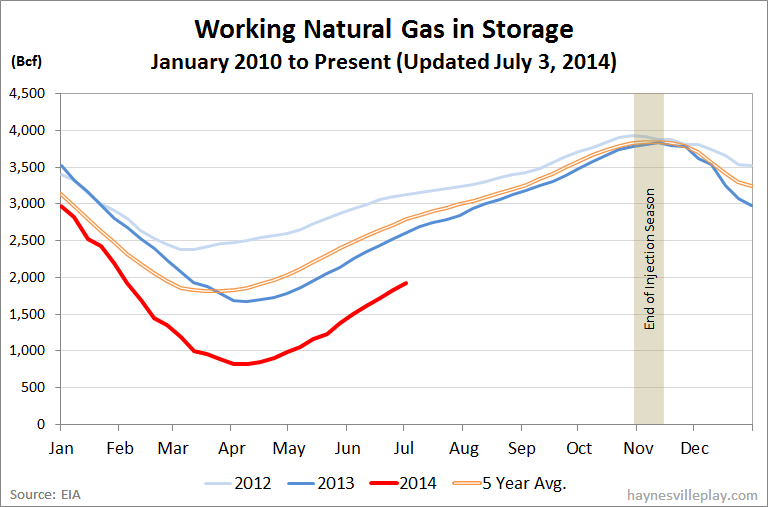 The EIA reported this morning that working gas in storage was up 107 Bcf to 2.129 Tcf. The weekly injection was 73% greater than last year (+62 Bcf) and 65% above the five year average (+65 Bcf). The current storage level is now 22.2% below last year (2.737 Tcf, a difference of 608 Bcf) and 25.5% below the five year average (2.856 Tcf, a difference of 727 Tcf). As shown below, the 2014 deviation from the five year average is becoming a mirror image of 2012 when storage levels blossomed before returning to more normal levels later in the year. While the current storage level is still nearly 3/4 of a Tcf below the five year average, higher than normal storage injections for the past three months have steadily chipped away at that deviation. The Baker Hughes U.S. rig count was up one this week to 1,875. 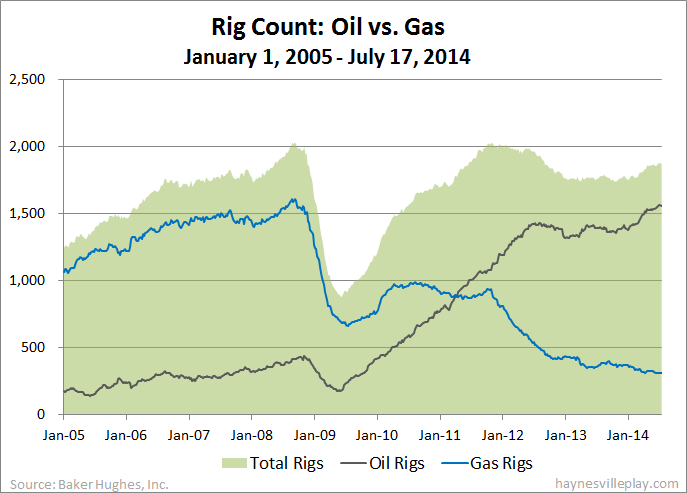 Oil rigs were up one to 1,563, while gas and miscellaneous rigs held at 31 and one, respectively. 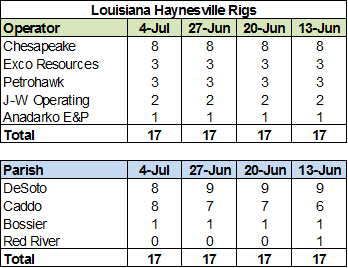 By type, horizontal rigs were up eight to 1,276 (an all time high, although not a big record to break since it was set only last week, and the week before...), vertical rigs were down seven to 377 and directional rigs were unchanged at 222. Among gas rigs, horizontal rigs were up one to 230, directional rigs were up one to 64 and vertical rigs were down two to 17.